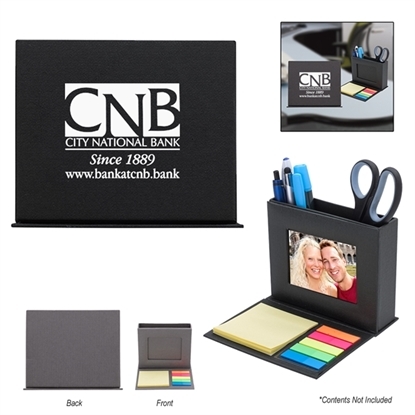 Allow your customers to stay organized with this desk caddy! It features a 3 1/2" x 2 1/2" photo window, allowing them to always have a fond memory nearby as they work. This item has a fold-down pad area with 3" x 2" sticky note pads and Mylar adhesive flags in five neon colors. This is available in black or gray and measures 5 1/2" x 4 1/2" x 1 3/4". Add your logo to this and give it to your employees as a gift. They'll love having everything they need for work within an arm's reach! 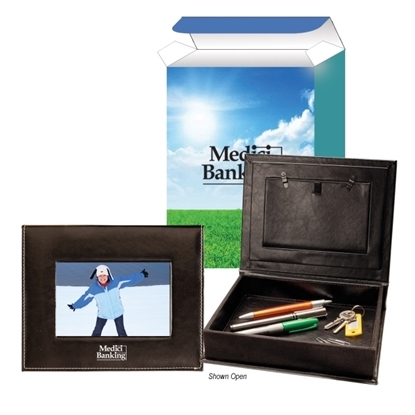 Give your clients a way to save those precious moments with this photo and memory box. It includes a one color imprint in one location and comes packed in a gift container with your beautiful 4-color processed artwork. This is perfect for events that are themed around family, looking within, and staying positive. Add your logo to this item and make this your next giveaway to leave everyone with a positive impression of your brand! Mypromotionalpens.com offers the largest and best priced selection in Promotional Combination Picture Frames. We will price compete and we won't be under sold. Let our graphic designers make your personalized Combination Picture Frames standout above the crowd at no charge. We won't stop until you are completely satisfied with your custom Combination Picture Frames art proof.Use category search filters on your left to help narrow your search to find exactly what you are looking for.